There is only one week left in October, and Southwest Kansas has not had a killing frost. 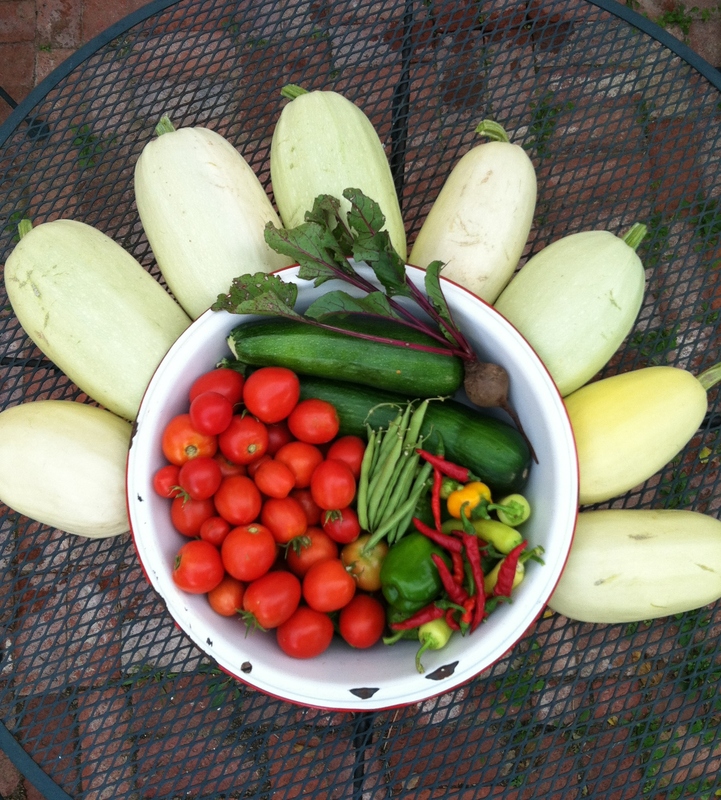 I have never had this amount and variety of garden produce to harvest this late into Fall. Zucchini, spaghetti squash, tomatoes, peppers – banana, bell, cayenne, cherry, green beans, and a lonely red beet were awaiting me this morning. Plus, the cayenne and cherry pepper plants are loaded with peppers still ripening. Each year I marvel at the results of planting a tiny seed and giving it a bit of TLC. However my greatest enjoyment is the harvest. I love serving and eating FRESH produce. I also thoroughly enjoy “putting up”. I fill my big upright freezer first, and then can the rest. 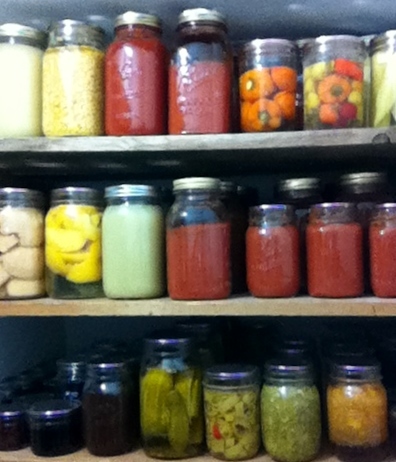 Freezer and shelves are both loaded for serving and eating home grown summer savory goodness all winter. Much the same as Paul prayed for the Christians of Colosse, today I pray for you. After three years, it is finished and hand delivered! That is two years ahead of schedule, or a year late depending what your view is. Oh goodness! I’m getting ahead of myself. 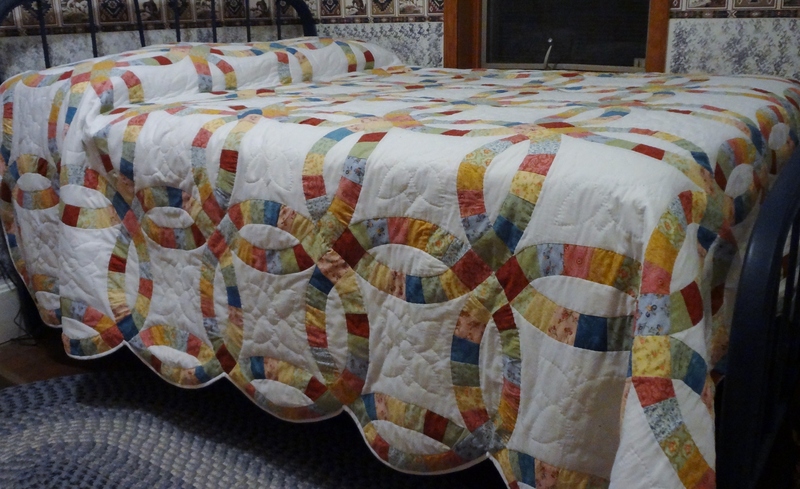 Last January, I began hand quilting the sandwiched top, batting, and back. Some women can sit and stitch day on end completing a quilt in a week or two. Not me! I stitch slow, and might get a day here or there that can be mostly spent quilting. However, most days I was only stitching a few minutes to an hour, and when summer rolled around, the quilt was all but forgotten. I basically took a four month vacation from quilting, while I gardened, farmed, mowed lawn, and remodeled the hall and bathroom. I simply threw a sheet over the quilt in quilt frames to keep it from getting dusty. It was there ready and waiting for stitching in the Fall. While working on this quilt, I spent many hours reminiscing and praying for my daughter. I also recognized a few things about myself. I can have a great idea or plan, but I can delay beginning due to fear of messing it up or not being satisfied with the end product. I am so thankful for the coaching and encouragement I received along the way. I did have some mess ups, and a few connecting points don’t look the best. The quilt is far from stitching perfection, but I’d like to think those little mistakes give it character. (Sorry if that comment made some of you expert quilters gasp.) I also learned the benefit of breaking down a big goal into several benchmark achievements. The big picture can be so overwhelming, but when I set realistic goals for specific steps (cutting, stitching arcs, piecing to filler pieces, completing the top, quilting one row…) it was not as daunting. These were not new self-discoveries, but it had been awhile since I was this challenged to work through some of my weaknesses, doubts, and fears. The bottom line was that I wanted this quilt gift to be perfect for my only daughter, and I knew before I began that it would be far from perfect. Quilts often tell a story. This one can be symbolic of relationships. God chose me to be the Perfect Imperfect mother of my dear daughter, and He chose her to be my Perfect Imperfect daughter. Those imperfections have been the tool to cause us to grow as individuals, and as mother and daughter. The double wedding ring pattern is symbolic of the love that binds a marriage. However, there is no marriage that does not encounter difficult times. In the Bible and first chapter of his book, James says, “when troubles come your way, consider it an opportunity for great joy. For you know that when your faith is tested, your endurance has a chance to grow.” James 1:2, 3 NLT If my daughter notices the imperfections in her quilt, I hope she is reminded to depend on God to help hold the stitches tight, rather than let her marriage unravel. I put in the last binding stitches just a couple days before we celebrated Christmas with our family. It was such a delight to be able to hand deliver this quilt just a couple weeks after my daughter’s 1st wedding anniversary. 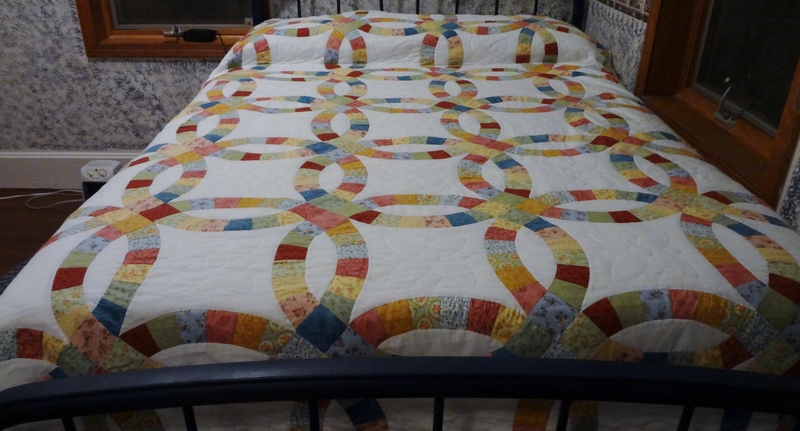 Through determination and perseverance, this Double Wedding Ring quilt was finished and delivered! Have you ever had a dry spell in your walk with God? A time when nothing horrible was going on. In fact, life was smooth sailing, yet you longed for growth that would result in maturity. A few months ago, when it was finally warm enough, I planted a long double row of beautiful bushy tomato plants. I fertilized, mulched, watered and anticipated big juicy ripe tomatoes. However, they just stood there barely growing an inch and didn’t bloom. I knew they were putting down roots, though. After watering regularly for 3 months, it began to rain. Showers and downpours in the midst of what is typically the hottest driest days of summer in Southwest Kansas produced miraculous growth and blooming in the tomato row. Now the plants are loaded with green tomatoes slowly ripening to red. Sometimes life is like that. We fertilize, mulch and water spiritually through Bible reading, study, church, prayer and such, yet feel like nothing is happening. No growth. No new insights. Don’t be disheartened, and don’t become lazy during this dry spell. Rather, being rooted and grounded in God’s word during the smooth time is what prepares us for the next growth spurt so we will be ready to stand strong, flourish and produce fruit.